To begin the registration process access the SRM Portal here. Select the register link to begin the registration process. You will need to provide login details to establish a secure log-in account to the portal. The login details pertain to an individual or employee within the supplier business that has a valid business email address and is the appropriate business representative responsible for managing the contract relationship and contract information with Queensland Urban Utilities. This person will be able to view contract details. To ensure successful registration, all company or business details need to be completed. For example ABN, ACN address and contact details of the business must be accurate. Please take care to ensure this information is completed in full. After completing the various fields in each tab select the next button to move through the registration steps. When all requested details have been provided, the person registering confirms their and the supplier organisation agreement to Conditions of Use by clicking the check boxes. Submit your registration by selecting the Register button. After completing this process you will receive an email from us confirming your registration request has been received. We will then review your registration application and the details provided. You will receive a second email confirming your request has been approved. This email contains a link enabling you to access the system and create a new password. For future visits to the site you will only need to enter your email address and password into the login screen. Workers Compensation, as per legislated requirements (sole traders exempt). Public and Product Liability (minimum requirements $20,000,000 per occurrence and in the aggregate). 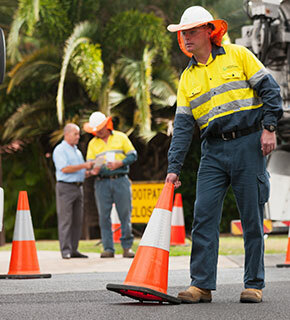 Queensland Urban Utilities may make specific requests for evidence of other insurance/s on a case-by-case basis depending on the type of service or products being supplied. For example a professional or consultancy service provider may be asked to provide evidence of Professional Indemnity insurance. We will review the submitted insurances and if the minimum insurance requirements are verified, the supplier will be deemed pre-qualified. If valid documents cannot be produced, then the supplier will be denied pre-qualification. The following provides a summary on some of the content within the portal. Public Announcements – Announcements for all users of the Portal. Each announcement displays the date and time the announcement was posted. Login and Name – Your login address, company name and logout link. Quick Links – Links to the most frequently used functions of the Portal. Recent Activity – Your portal activity for the last 10 days. The side menu is located on the left hand side of the home screen and contains links to the various screens available to each supplier. You will only see items in the menu that you have permission to access. Clicking on a menu item will open the content in place of the dashboard. The Communications tab provides you with a record of all communication pertaining to the contract nominated in the drop-down option box. From the Communication tab you can search, view and respond to communication. Click on an item in the list to view or respond to it. Each line item displays the subject, sender, sent date and status. You can create a new communication by selecting the Create New Communication link in the top left of the tab. The Contracts window lists all the contracts you hold with Queensland Urban Utilities. From this menu you can search for, and select, a contract. The contract list displays the contract number, title, start date, finish date, contact name and contact email for each contract. In order for suppliers to be able to see contracts in the Portal, they must be added as an external supplier contact to the contract. If a supplier is unable to see one of their current contracts and access to the contract is required, liaise with the relevant Contract Manager and they will assign the supplier as a contact to the contract. From the Supplier Insurance tab you can view the insurance items listed for you, as a supplier. The Supplier Insurance tab lists the Insurer, policy number, amount insured, insurance type, status, expiry date and commencement date for each policy. From this tab you can also create a new supplier insurance item. Select the Create New Supplier Insurance link. Complete the insurance detail fields, and upload attachments if applicable. Select the SUBMIT button. You will be prompted to confirm your submission. Select continue to confirm. The User Settings screen is where you maintain your account and contact details. All suppliers are required to ensure all contact information is kept up to date. The addresses screen usually includes a Billing, Company and Mailing address. You can add a new address by clicking on the Create New Address link or select an existing address from the list to edit it. When editing an existing address, update your changes as required and click on the Submit button. When editing an existing address you also have access to the Delete button, however an address cannot be deleted if it has been used in a prior communication. The contacts screen allows you to maintain contact details for employees associated with your organisation that are relevant to your contracts. You can add a new contact by clicking on the “Create New Contact” link or select an existing contact from the list to edit it. To update the contact, edit the details as appropriate and click on the Submit button. Please note that you are not able to edit email addresses as they are used for logins to the Portal. To delete a contact, click on the Delete button. You are not able to delete contacts that are associated with other objects in the Portal such as Communications and Adjustments. This will allow you to change your account password for the Portal. The Contact Us screen displays contact details that can be used for general Contracts Portal enquiries. If you have a query that is specific to a contract, you should use the contract contact details.